St. Johnswort, shown here, blooms abundantly in mid- to late-June. The perennial stands 1 to 2 feet high. 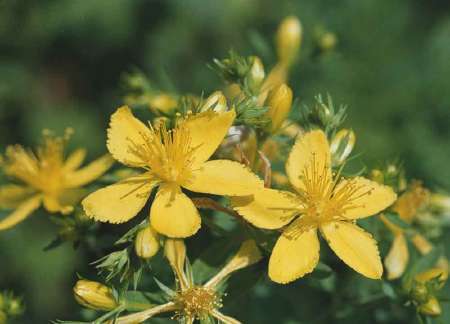 The bit of yellow that may catch your eye along Westborough's roadsides as you drive from place to place at this time of year is likely to be none other than common St. Johnswort, the plant whose possible antidepressant properties have received so much attention in the past few years. Common St. Johnswort (Hypericum perforatum) came to this country from Europe and now grows as a wildflower--otherwise known as a weed--across the continent. Here in Westborough it appears in relatively dry areas in fields, at the edges of parking lots, along roadsides, and sometimes as an uninvited guest in flowerbeds. The plant is a perennial and stands 1 to 2 feet high. The plants bloom abundantly in mid- to late June but may continue to flower less vigorously throughout the summer. The yellow flower petals turn red if you crush them. If you take a close look, you can see that the flower's five yellow petals have tiny black dots along the edges. These dots are actually oil glands. Likewise, the leaves have tiny translucent dots on them which are also oil glands. The leaves and flowers with their dots are a source of one or more chemical substances that are under investigation for possible effectiveness against depression. The plant contains at least half a dozen biologically active chemicals. Medicinal uses for common St. Johnswort date back to the Greeks and Romans, but over the centuries it has gone in and out of favor as an herbal remedy. As a tea, it has been used in the past to treat wounds, bladder problems, fevers, and even worms, as well as what used to be called melancholy. These days in Germany it is a top-selling herbal treatment in pill form for mild to moderate depression. The name St. Johnswort may be related to the fact that the plant blooms around the time of St. John the Baptist's birthday, June 24. The word "wort" is simply an Old English word for "plant." In addition to common St. Johnswort, there are a number of other species of St. Johnswort. Out west, the plant is known as Klamath weed. It spreads aggressively in some areas, and is reputed to make the skin of animals that graze on it sensitive to sunburn. It may do the same to people who take it as an herbal remedy. In some places out west, certain insects have been imported from Europe to keep the plant in check.